GetApp´s quarterly ranking (GetRank) is aimed at small and medium sized businesses looking to make a first assessment of cloud-based social media marketing software. 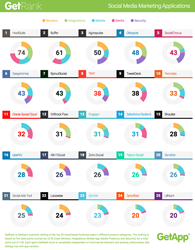 Updating its quarterly ranking of the top social media marketing software, cloud-based business apps marketplace GetApp has released its ranking for Q1 2016; HootSuite stayed on top for a third quarter in a row, while Buffer and Agorapulse remained strong in second and third place, respectively, since last quarter. The ranking, which is aimed at small and medium sized businesses looking to make a first assessment of cloud-based social media marketing software, is scored using five data points: reviews, integrations, media presence, the availability of mobile apps, and security. Each data point is worth 20 for a total possible score of 100. HootSuite topped the list with a perfect 20 for integrations, tying 2nd place Buffer with a score of 19 for its iOS and Android mobile apps. Agorapulse took the lead for reviews, as well as tying 4th place Oktopost with a 15/20 for security. It was HootSuite, however, whose 20 in social media helped secure their number one position. “Social media presence is an especially important metric for marketing applications, many of which specialize in this area or integrate their products with these platforms. It’s no surprise that the leaders in social media marketing all scored highly for social media, reflecting strongly on their familiarity with a key feature of their platform,” says Suzie Blaszkiewicz, researcher and project manager for GetRank. The scores are calculated using information listed on GetApp. Reviews are based on the number and average rating of user reviews on GetApp, while integrations are based on the number of software integrations listed. Mobile scores are based on the availability of an iOS and Android app and their corresponding scores in the app stores, while media presence is scored based on the number of Twitter followers and Facebook fans that an application has. Finally, security scores are based on answers to a vendor-completed security survey based on the Cloud Security Alliance’s Self Assessment Form. Click through to see the entire Q1 2016 GetRank of top social media marketing apps. You can also download a free copy of our report, Marketing in the Cloud, for trends and insights into the marketing space.